What Are The Reasons Why The Vacuum Bag Seal Cannot Be Sealed? The heat sealing temperature is not enough. Under normal circumstances, the composite bag with Obrbr as the lining, when the total thickness of the bag is 80-90μm, the heat sealing temperature should reach 170-180 °C; the total thickness of the composite bag with brE as the lining is 85-100μm. When the temperature is controlled, it is controlled at 180 to 200 °C. As long as the total thickness of the bag is increased, the heat sealing temperature must be increased accordingly. The heat sealing speed is too fast. Sealing is not related to the speed of the sealing machine. If the speed is too fast, the sealing part will be transferred to the cold pressing place for cooling in the future, and naturally it will not meet the heat sealing quality requirements. The pressure of the cold pressure rubber wheel is not suitable. There is one on each of the cold-pressing rubber wheels, and the pressure between them should be moderate. When adjusting the pressure, only the spring should be clamped. There is a problem with the quality of the vacuum bag. 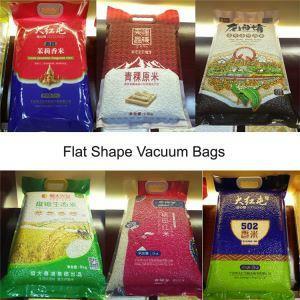 Sealing is not related to the quality of the vacuum bag. If the corona treatment of the composite lining is not uniform, the effect is not good, and it happens to be in the sealing position, and it is certainly impossible to seal. This situation is rare, but once it appears, the product is bound to be scrapped. If the vacuum bag is hydrated or dirty at the seal, it will also cause the seal to be weak. In short, to solve the problem of the first type of sealing is not strong, generally can properly increase the heat sealing temperature, and then reduce the heat sealing speed, while increasing the pressure of the cold pressure rubber wheel. Previous: What Are The Precautions When Using A Vacuum Packaging Machine? Next: What Are The Types Of Automatic Packaging Machine Equipment Failures?